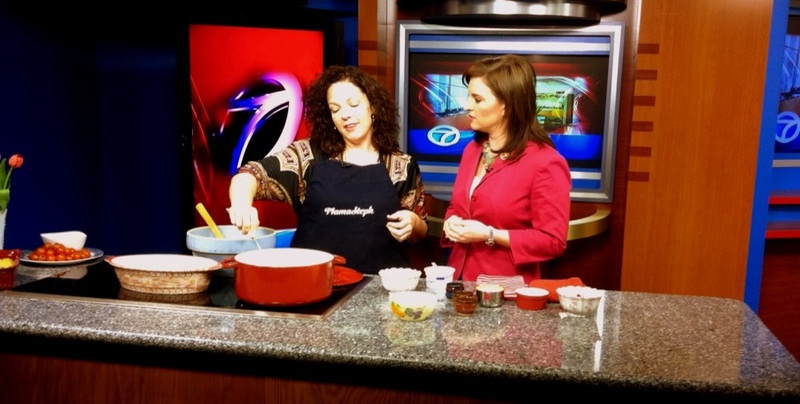 I’m so excited that I was asked back to cook on KLTV7 in Tyler during tonight’s 5pm news. I always look forward to doing the cooking segments with my friends at channel 7, as they are so welcoming and helpful to me, and then when the news is over, they devour the food I bring for the segment and tell me how much they like it. That is the super-fun part for me. 🙂 I love to see people enjoy eating what I’ve made for them. 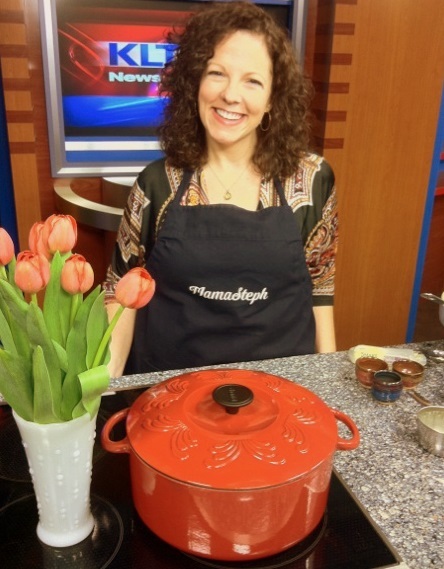 Here’s the link to the video of the segment; it’s only about 3 minutes long: MamaSteph on In The Kitchen. I took an informal poll on my Facebook page a few days ago. I asked my friends whether they’d rather have a recipe for comfort food or for something sweet on In The Kitchen, and comfort food got the vast majority of votes. Several people specifically mentioned macaroni and cheese or pasta in some form. Then, a little bird told me that my host tonight on the air, the lovely and talented Jennifer Hines, would really love it if I’d make my Grown-Up Grilled Cheese Sandwiches or Creamy Incredible Macaroni and Cheese. Then my friend Hallye mentioned that she’s trying to “lighten-up” her eating now for spring, which is something we all need to do sometimes, I think. 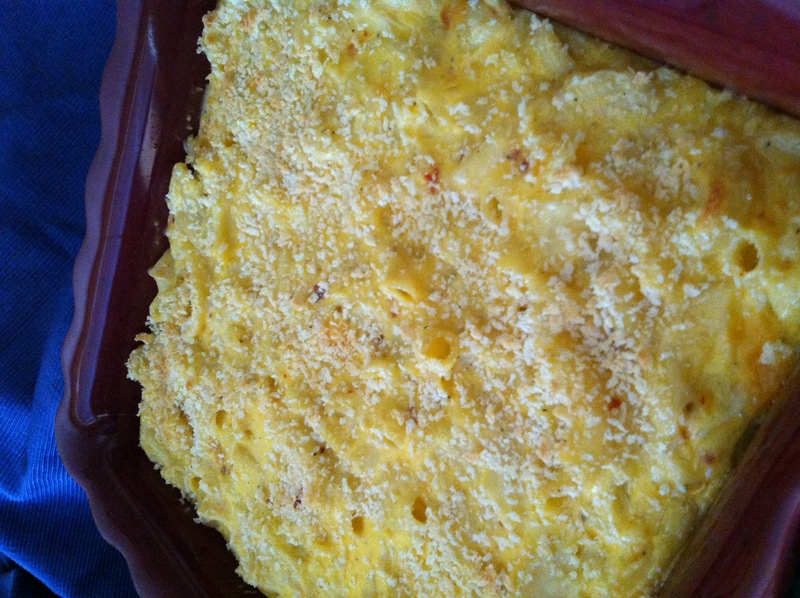 So, I put two and two together, and came up with a new version of my mac & cheese that you can feel better about eating if you’re trying to cut some fat from your diet! You may wonder if it can possibly be any good if I take out the good butter and heavy cream and all of that spectacularly flavorful stuff. Well, I did an experiment. I made a batch and gave it to my husband’s parents, not telling them it was lower fat. Later they both told me that they ate it all up and that it was wonderful! So I think it passed the test! Because of the dry mustard and the teaspoon of zesty red pepper flakes, there is so much flavor in this cheese sauce, so this dish still has lots of palate-pleasing flavor, even for picky eaters! I suggest that you take this basic recipe and then customize it for your family. For instance, if your family loves bacon, you could add some bacon or turkey-bacon, pre-cooked and crumbled, and let that good flavor bake into the pasta. You could do the same with fresh sliced mushrooms, or some diced tomatoes and pepperoni for a more Italian take on mac & cheese. Experiment! There’s no reason to be shy in the kitchen; it’s fun to try new things, and you may just hit on your new favorite thing! In a saucepan, melt the four TBS of the butter-blend over low-medium heat. Stir in the grated cheddar cheese, allowing it to completely melt while stirring. Add the soup, light sour cream, half & half, salt and pepper, dry mustard, and red pepper flakes, continuing to stir until it is mixed well. Add the Egg Beaters, stirring until everything is smooth and well-combined. 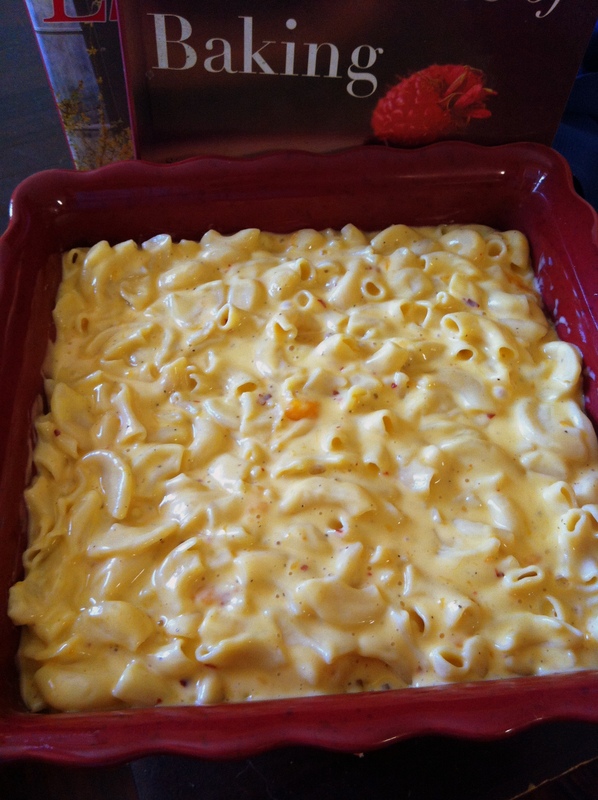 In a large pot, combine the drained pasta and the cheese sauce, stirring until the macaroni is evenly coated with cheese. Transfer the pasta to a Pam-sprayed 2 quart casserole dish. Sprinkle top with a handful of bread crumbs or crushed buttery crackers, if you like. Bake at 350 degrees F for about 25 minutes. If you’d like to brown the top a bit before serving, put it under the broiler for a short few minutes, keeping a close eye on it so you don’t burn the top. I love mac and cheese! Your lighter recipe looks amazing! I appreciate that encouragement, Michele! 🙂 You are so kind. I love mac and cheese, and the light version is still great! Thanks, Steph! I am definitely going to try this. Thanks for making a lighter version for those of us trying to be good. Of course, won’t tell the fam it is “light”. You’re welcome, Hallye. 🙂 And I don’t think they’ll notice the difference! In the studio, several people actually preferred the light version to the regular version I also brought. That was surprising to me!